Are you aware that a typical American family struggles to save energy and spends a minimum of $1,900 per year with their gas company on utility bills? Sadly a great amount of that energy goes down the drain. Additionally, the electricity generated by fossil fuels in a single home deposits more carbon dioxide in the air as compared to emissions of two average cars. However, there is good news as you can do many things to save energy and money. You should start with small changes in your home. 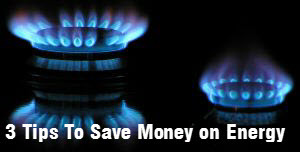 The secret to these savings is having an energy efficiency plan for the whole house. First of all, your house should be viewed as an energy system having interdependent parts. As an example, the heating system in your house is not merely a furnace. It is a system for heat delivery that begins at the furnace and releases energy in your home as a whole by using a network of ducts. Even an energy efficient furnace will waste much fuel if the walls, ducts, windows, doors and attic are not sealed and insulated properly. If you make energy efficient improvements, then you can have a comfortable home. And, it will yield financial rewards in the long run. If your utility bill is reduced, then it compensates for the high price you might have paid to get energy efficient appliances. Further, if you ever plan to sell your house, you could get an excellent price. Below mentioned are some of the tips to save energy at home while doing your daily activities. Save Energy Tip #1: Instead of using the drying cycle of your dishwasher, you should air dry dishes. Save Energy Tip #2: Switch off your monitor and computer when not in use. Save Energy Tip #3: Plug home electronics into power strips and turn off the switch of the power strips when you are not using the equipment. If you put DVDs and TVs in standby mode, they will still use a lot of power. Besides the above mentioned instructions, you should also take other measures like cleaning the filter of your cooler or heater. If the filter is dirty, then the machine will consume more energy. This will result in higher utility bills. Therefore, check and clean the filter regularly. Further, instead of cooking in a microwave, use a solar cooker. This machine uses less energy than the oven. You can cook a lot of meals without wasting energy and money. Further, the freezer should be cleaned, and defrosting should be done regularly. This will prevent consumption of energy while freezing. Whenever you buy an appliance, ensure that it has the energy star label. This is a guarantee to reduce your high electricity bills. These are a few tips for saving energy at home which will definitely cut down your electricity bills. If you need any further information, you can check out our Insider Choice Inner Circle program. See how you can get it for FREE at My Choice Energy plans. Don’t forget to grab your FREE copy of our 65 page report on the 7 secrets that you must know right now to save up to 40% on your energy bills in the top right corner of the page. One last thing, let us know what you think about this article and what you would like to learn about in the future by commenting below. We’d love to hear your comments and see if you want to share any tips on how to save energy at home.